They’re trained in the art of nutrition. Their goal is to help you put healthy meals together and hit your nutrition goals. So let’s turn the tables, and find out how a registered dietitian plans her daily meals. Emily Monfiletto is a Registered Dietitian. She works with clients at the OhioHealth McConnell Heart Health Center. 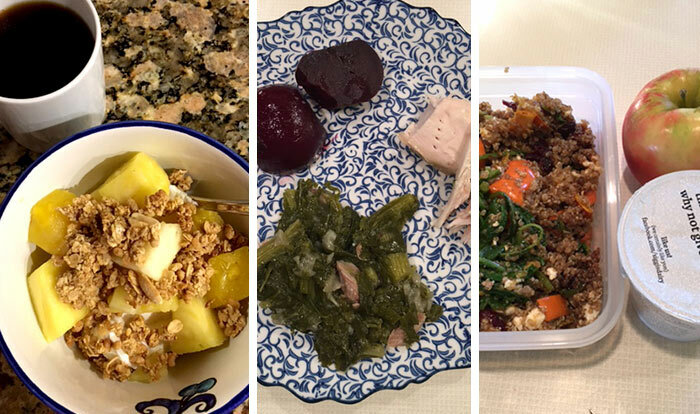 We asked Emily to take us through a typical day of eating. We also wanted her to share the reasoning behind her nutrition choices. Pictured: Quinoa, squash and kale salad with feta and cranberries and an apple on the side. I will save the yogurt for my snack in the afternoon. I always make my lunches on Sunday and eat them throughout the week. What if you get caught at work, starving and out of snacks? I try to start with a larger meal earlier in the day, which means breakfast is usually my biggest meal. I always try to get a source of protein at breakfast and then the meals get lighter during the day. I usually try to eat a vegetarian lunch. I like to incorporate beans, grains, or some dairy for protein sources. I have my snack in the afternoon to help get through the day and prevent myself from being too hungry when I get home for dinner. For dinner, we regularly cook meat with vegetables. Sometimes we will include a starch, but it just depends on what we have. We eat a lot of leftovers in my house to make weeknight meals a little easier.